For a moment, think about a mistake from your past. Not just a little error, but a big misstep that you would give just about anything to erase. For Allison Campbell, a past relationship is that mistake and in Dying Brand, the third in Wendy Tyson’s smart and suspenseful series, that mistake from her past is coming back to haunt Allison’s present . . . and derail her future. Dying Brand begins with what should have been a night of celebration for Allison and a young friend. But a phone call from the wife of her ex-boyfriend quickly casts a pall over Allison’s evening. All of a sudden, she finds herself in the middle of a murder investigation and the target of a malicious attack on her character. Allison starts receiving photos of herself – taken without her knowledge or consent – in very private and intimate scenarios. And then her loved ones begin getting them, too. But without any blackmail demands, and in the absence of any answers from the man who took the pictures, Allison doesn’t know which way to turn to figure out who is sending the photos or what to do to make him or her stop. Nor does she know why her name was in the calendar of her ex on the day he ended up being killed. With a deft and talented touch, Wendy Tyson leads her readers through a cryptic and puzzling maze. Each chapter is a piece of the larger puzzle, but the full picture is never quite clear until our storyteller pulls back the curtain and reveals every detail. 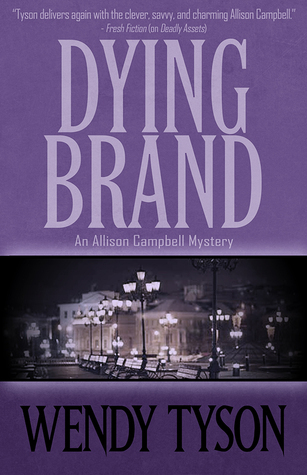 Dying Brand is engrossing and mesmerizing; a roller coaster ride of thrilling suspense, blackmail, and murder. My thanks to Henery Press for providing me with a copy of Dying Brand in exchange for an honest review. I received my review copy via NetGalley.